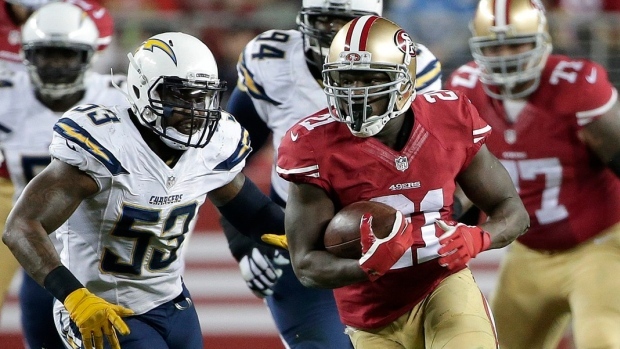 SANTA CLARA, Calif. - For weeks, Frank Gore has been pondering the reality he could be playing his final game with San Francisco on Sunday. He briefly became quiet Tuesday just talking about it, saying he would like nothing more than to return to the 49ers next season, his only team as a pro. Especially after the way this year went, missing the playoffs following three straight trips to the NFC championship game and a Super Bowl near miss. "But I know the business of it. The organization has been great, they've been great to me. I just want to finish strong in front of my fans. Hopefully we can get a win, and I'll see from there." San Francisco's all-time leading rusher needs 38 yards Sunday against Arizona for his fourth consecutive 1,000-yard season and eighth in his 10 NFL seasons. The Niners (7-8) need to beat the Cardinals to avoid their first losing season under embattled fourth-year coach Jim Harbaugh. The University of Michigan on Tuesday posted a birthday greeting and photo of Harbaugh via Twitter as he turned 51. His alma mater is a suitor for his services, with unconfirmed reports over the past week the university has already made a six-year offer. Gore, who has voiced support of Harbaugh, finished with 158 yards against the Chargers after breaking four tackles on the 52-yard scoring run in the first quarter. He's showing no signs of being slowed after the concussion sustained at Seattle on Dec. 14. "I expect a lot out of Frank and there's not too much he does that amazes me anymore because that's just the standard he's set for himself," quarterback Colin Kaepernick said. "He's a huge asset and I'm hoping he's back here. Feel a lot more comfortable with 21 in the backfield." Gore said there have been no formal discussions with the front office about what might be next. General manager Trent Baalke on Thursday acknowledged the mutual interest to CSN Bay Area and said the 49ers hope Gore returns. "Hopefully I'll be back," Gore said. "The organization, they love me and they respect me. I want to be back, yeah, hey, I was raised here. I don't know nothing else." The running back doesn't even know who the coach will be come 2015, so that person would likely have a say. Harbaugh has kept quiet throughout the speculation about his future. "I respect that. That's hard, man, that's hard to do. He still came to work every day, worked hard and tried to win," Gore said. "He's a great coach. I just feel like it's hard to come in this league and do what he did." Harbaugh has praised Gore for his handling of a difficult season and a year in which his workload has been less than what he's accustomed to or desires. "He's an unwavering professional in everything that he does. Great to be around. Loved by his teammates and coaches. He's a joy to be around every day," Harbaugh said. "Boy, he's the most or as motivated as any player I've ever been around to play the game. I think back to 2011 when he had the ankle injury and we were playing against the Eagles. He really wasn't able to walk on it all week and then went out and rushed for over a hundred yards. It's special." At 31, when people questioned whether Gore could still run like an elite NFL back, he arrived at training camp and said he was ready to prove wrong all the critics. Now, there's some unfinished business with the 49ers before he leaves, such as turning things around again in 2015 and getting back to the Super Bowl and winning this time. "It's been tough. You look at the last three years, we've been the top dogs of the NFL. This year has been very tough for us. That's stressful," Gore said. "That's my goal. When you play this game that should be your goal. We got there and we didn't finish. I know we've got the people to do it. This year was a crazy year, too many injuries and just a lot."